Rockstar Energy Suzuki World MX1 were able to complete a positive end to the 2013 FIM Motocross World Championship with Kevin Strijbos finishing as runner-up at Lierop for the Grand Prix of Benelux and capturing fourth position overall in the MX1 standings. The Belgian's efforts on the works RM-Z450 meant that the team have two riders in the final top four ranking of MX1; and with Strijbos' result in the last round of 17, the crew has accumulated 19 trophies over the course of the season. Lierop, deep in southern Holland and smashed by heavy showers on Sunday morning, failed to deter 17,000 fans, and although the weather turned throughout the day into sunshine and decent temperatures - drying the soft sand - the terrain was still incredibly demanding and punished the smallest mistakes. Strijbos set the fastest time on the RM-Z450 in pre-qualification but the 28 year old's biggest problem through the two 35 minute and two-lap motos on Sunday was keeping a consistently-effective rhythm. 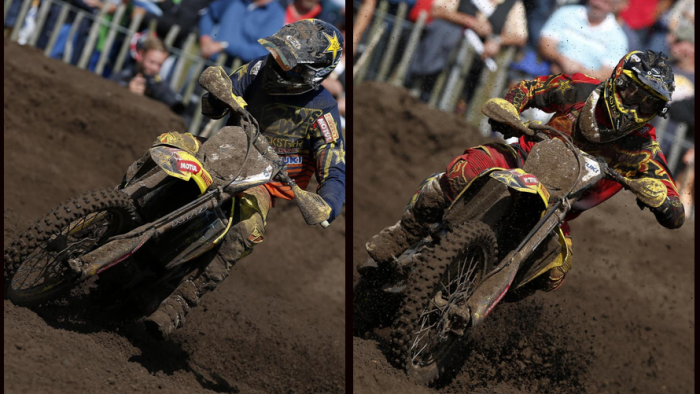 Operating at the site of his last GP victory in 2007, Strijbos pushed his way into the lead in the first outing but a cautious approach to conserve energy backfired as he was caught by both Antonio Cairoli and Shaun Simpson. The '#22' would recover to grab second place but some lethargy and errors at the beginning of the next moto meant that second spot again to Cairoli (with Simpson third) was not enough to grab the overall top-step of the rostrum by just one point. Team-mate Clement Desalle had won the previous three rounds and had confirmed second position in the MX1 Championship behind Cairoli even before the Dutch meeting. The Belgian never really gelled with the track through the weekend and with the even rougher conditions on Sunday he was never a factor for a podium finish. A crash on the first lap of Moto1 left the winner of four MXGPs this year winded and far behind the pack. He tumbled again later on but made his way up to 12th. In the second race he initially rose as high as second and then joined Strijbos in a five-rider scrap for the slot behind the disappearing Cairoli. Taking it easy and playing a smart game on a day that he knew would not belong to him, Desalle scored sixth place for ninth overall. In total Strijbos accrued six podiums in his first term back with the team while Desalle managed 13. The 2013 campaign is not quite over for Desalle and the Suzuki squad: The 23 year old will lead Team Belgium at the 67th Motocross of Nations in three weeks time at Talkessel, Teutschenthal in Germany for the most eagerly-awaited MX spectacle of the year. "I'm happy with second place in the championship but not so much with the weekend. I didn't really feel great throughout this GP. A lot of rain during the night changed the track a lot and made it really tricky. I had a bad crash on the first lap of the first moto. I had wanted to keep a nice rhythm because I knew it would be a long race but I made a small mistake and the handlebars went straight into my stomach. I couldn't breath for 20 or 30 seconds. I restarted last and it was bad race. The second moto was not some of my best riding either in the sand. So, I'm a bit frustrated with this GP. Finishing runner-up for 2013 is both good and bad because I want to make that last step to the top and I'm working on it all the time and I think I proved in the last few GPs that I can make it happen." MX1 Moto1: 1. Shaun Simpson (GBR, Yamaha), 41:15.958; 2. Kevin Strijbos (BEL, Rockstar Energy Suzuki World MX1), +0:21.348; 3. Evgeny Bobryshev (RUS, Honda), +0:41.170; 4. Antonio Cairoli (ITA, KTM), +0:58.008; 5. Ken de Dycker (BEL, KTM), +1:12.295; 6. Jeremy van Horebeek (BEL, Kawasaki), +2:00.071; 7. Tommy Searle (GBR, Kawasaki), +2:10.185; 8. Joel Roelants (BEL, Yamaha), +2:18.160; 9. Gautier Paulin (FRA, Kawasaki), +3:12.542; 10. Marc de Reuver (NED, Honda), -1 lap(s); 12. Clement Desalle (BEL, Rockstar Energy Suzuki World MX1), -1 lap(s). MX1 Final World Championship Standings: 1. Antonio Cairoli (ITA, KTM), 761 points; 2. Clement Desalle (BEL, Rockstar Energy Suzuki World MX1), 671 p.; 3. Ken de Dycker (BEL, KTM), 607 p.; 4. Kevin Strijbos (BEL, Rockstar Energy Suzuki World MX1), 553 p.; 5. Gautier Paulin (FRA, KAW), 539 p.; 6. Tommy Searle (GBR, KAW), 487 p. 7. Jeremy van Horebeek (BEL, KAW), 431 p.; 8. Evgeny Bobryshev (RUS, HON), 348 p.; 9. Shaun Simpson (GBR, YAM), 316 p.; 10. Maximilian Nagl (GER, HON), 314 p.